Sutton Coldfield TV transmitter was one of the first in this country when it began broadcasting the BBC on the old 405 line VHF system in 1949, UHF colour transmissions started in 1965. The original mast was demolished in 1985 and the replacement is a 225m high (see How High is High ? ) mast which was built in 1983. Apparently the older structure was insufficiently strong to take the weight of the increasing number of transmitting antennas required. To make things even more complicated a 225m temporary mast was erected in the spring of 2009 so that work could proceed in raising the height of the original mast by 31m (to a total height of 271m). This second mast was dismantled from Summer 2013. The site is not quite in Sutton Coldfield but being just North of its namesake it is visible from most areas North of Birmingham. The railway line to Lichfield runs near to the site, this particular section being opened by the London & North Western Railway in 1884. Overall view of Sutton Coldfield`s (original) television transmitter. Sutton Coldfield transmitter looking majestic against the spring sunshine. View of Lichfield transmitter (originally the ITV transmitter, Sutton Coldfield being the BBC transmitter) from one of Sutton Coldfield`s outer most stay anchor points. There were a few tandem transmitter set ups when TV was VHF. Note the tensioning mechanisms for the stay ropes. 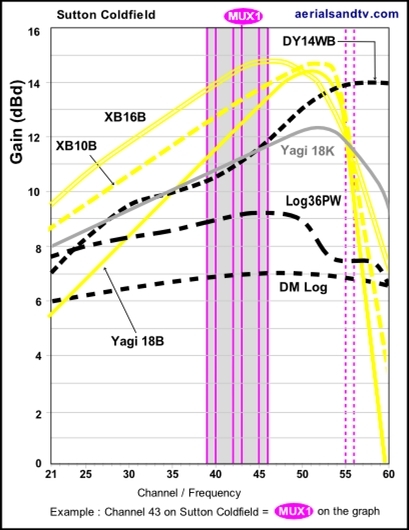 Also see other relevant B group curves, and inconsistent gain curves of some Contract aerials. When Sutton Coldfield had two masts (the original mast is on the left). 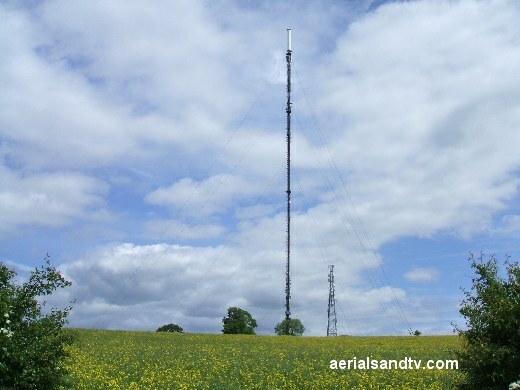 As part of the work required for DSO a 225m temporary mast was erected in the spring of 2009 so that work could proceed in raising the height of the original mast by 31m. Thus the mast will eventually be a total height of 271m. This second mast was dismantled from Summer 2013. Note, due to the new phenomenon of MUXICAL chairs you may experience problems with certain MUXES disappearing. First try rescanning your TV / set top box, do it manually if possible. If this fails to sort it check on transmitter work or call the reception advice phone numbers. Also see basic digital fault finding. 700MHz clearance occurred at Sutton Coldfield in March 2018 though only MUXES 7 & 8 moved (to CHs 55 & 56), plus one of the local MUXES moved 51 > 48 (the other stayed on 36). 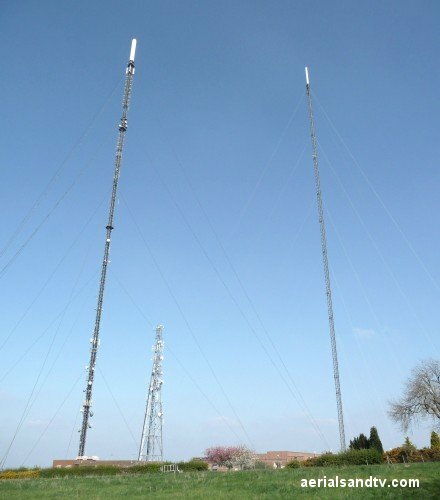 Sutton Coldfield transmits all six MUXES at 200kW, making it the (joint) most powerful transmitter in the UK. Note the huge increase in power at the 2011 digital switchover. Sutton Coldfield is a B group and aerials on it should be horizontally polarised. 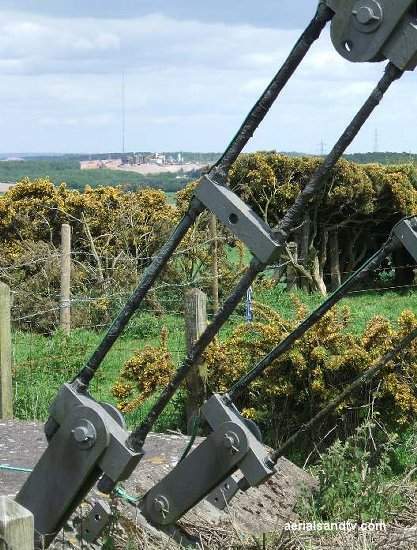 The transmitter has nearly forty smaller repeaters (including Bromsgrove and Lark Stoke) to help improve its coverage in hilly areas. 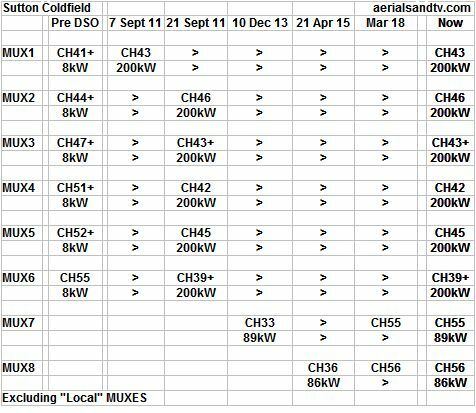 This table below also includes the same information for some of the other transmitters receivable in the area, Waltham, Sandy, Oxford, Lark Stoke, Ridge Hill, Bromsgrove, Malvern, Brierley Hill, The Wrekin, Winter Hill, Emley Moor and Belmont. Note how they “dovetail” together in an attempt to minimise co-channel interference. The channel allocation guides can be very useful in the diagnosis of co-channel interference problems and can also be invaluable if you are trying to find a spare channel for a modulated output (e.g. for a Sky box or CCTV system) to be added to your TV setup/distribution system without suffering from co-channel. Also check Sutton Coldfield`s thirty eight smaller repeaters. Sutton Coldfield has the third highest population coverage (approx 5 million) of any transmitter in the UK and broadcasts to many major towns and cities including Birmingham, Wolverhampton, Coventry, Leicester, Derby and Stoke. For Sutton Coldfield we recommend the DM log for strong signal areas, the Log36 or Yagi 18K for medium signal areas, the Yagi18B for outdoor installs in poor signal areas, the XB10B for loft installations in poor signal areas, and the XB16B for those with the most marginal signals. Unless you have a massive loft we`d normally recommend an XB10B for loft installs over an XB16 due to smaller size of the former aerial. The dimensions and test performance of the aerials can be found on the relevant tables.